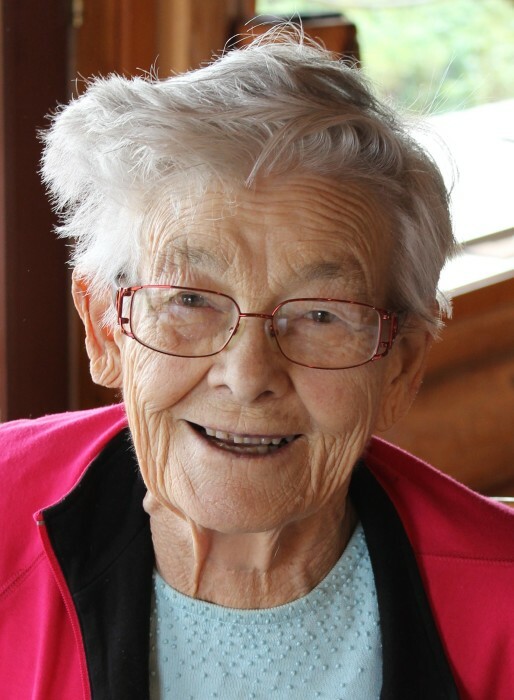 Selma Siemens (nee Klassen), age 89, passed away Thursday, November 8, 2018 at the Herbert and District Integrated Health Care Facility, Herbert, SK. Left to cherish Selma’s memory are her children, Carolyn (Doug) Bradshaw, Carl (Hollyce) Siemens, Greg (Stephanie Hanna) Siemens, and Peggy Siemens; her daughter-in-law, Gladys Wozny Siemens; her grandchildren, Keith (Shelly Holenski) Bradshaw, Carrie (Will Doyle) Siemens, Jolene (Ryan Paradis) Siemens, Allison (John Worsley) Siemens-Worsley, Lea (Simon) Nakonechny, Jamie Powell, and Amelie Dedelley; her great-grandchildren, Samantha Bradshaw, Romy Nakonechny, Grace Siemens Paradis, Alais, Blythe, and Enzo Worsley, Donovan Jocobs, and Ronan Powell; her siblings, Neil Klassen, Justine Funk and Elizabeth Nakonechni; and by many nieces and nephews. Selma was predeceased by her husband, Henry Siemens; her son Robert (Bob) Siemens; her parents, Peter & Elizabeth (Schultz) Klassen; and by her siblings, Hannah Simons, Harvey Klassen, Helen Dyck, Paul Klassen, Norman Klassen, and Kathleen Banman. Selma Rose Siemens was born January 19, 1929 to Peter & Elizabeth (nee Schultz) Klassen on her family homestead in the Donnellville District, SK. She also attended school there before moving to Herbert to complete her high school. Selma married Henry Siemens in 1947 and they eventually settled on their own farm in Donnellyville. The challenges of life on the farm never discouraged her, and she always found ways to make the best of what she had. Selma raised her five children to have the same innovative spirit and can-do attitude that she brought to everything she did. Selma enjoyed curling, softball, traveling, and spending time with her family. She played guitar and loved to entertain her grandchildren with songs. Selma also enjoyed a good bargain and was a regular at the MCC in Herbert and auction sales in the area. She loved history and liked to preserve the past by collecting antiques. Even faded or broken, she saw the value that things had held to past owners or looked at the potential they could still have in the right hands. Selma was always selfless, generous, and willing to help anyone in need. She willingly welcomed people of all ages into her home, including the entire Donnellyville school students and teacher when the school burned to the ground. She also served as a home care worker for many years. She believed everyone deserved a fair chance in life and fought for those who she thought needed support. Selma was very active in her community and sat on many boards and committees, including the Rolling Hills Health District, Wheatland Home Care, Herbert Hospital Auxiliary, Herbert Heritage Association, and many others. She was also active politically with the Saskatchewan NDP. No challenge was too big, and if she saw something she thought could use improvement, she set to work with optimism and determination to do better. Selma was a pillar in her community, she will be greatly missed and remembered with love by many. Selma wished to pass on these words of advice, “Do unto others as you would have them do unto you,” and “Love thy neighbour! Red and yellow, black and white.” It is with sadness in her passing, but joy in her life, that we celebrate an incredible woman who left a lasting impact on so many. The Funeral Service for Selma Siemens was held on Saturday, November 24, 2018 at 2:00 pm from the Swift Current Funeral Home Chapel, Swift Current, SK with Jolene Siemens serving as MC. Special music was brought by Mark Penner. The obituary and memories were shared by Allison Siemens-Worsley. The eulogy was given by Lea Nakonechny. The Private Interment Service was held prior to the Funeral Service from Rush Lake Cemetery, Rush Lake, SK with Keith Bradshaw, Carrie Siemens, Lea Nakonechny, Jolene Siemens, and Allison Siemens-Worsley serving as Pallbearers.